Juliet Karelsen studied painting at The School of The Art Institute of Chicago and The Skowhegan School of Painting and Sculpture. She has been painting for many years and experimenting with different forms of stitching for the last few years. Her work has been shown across Maine, New York City, New Hampshire, Boston, Ohio and abroad in Spain, Argentina and Switzerland. She was born and raised in New York City and has been living in Maine (mostly) since 1991. Her work can be found at julietkarelsen.com. Alison's sources are often derived from literature and history. In her current body of work she has been combining disparate ideas concerning migrations, refugees, medical drawings, astronomy, architectural traces, and more. Visual representations of these interests appear as a shape shifting progression where one image morphs into another, changes but still holds the prior imprint. Click here to find more of her work. A graduate of University of Hawaii and Pratt Institute, Garry Mitchell has exhibited his work nationally and internationally. He has received fellowships from Yaddo, The MacDowell Colony, the Edward Albee Foundation, and the Provincetown Fine Arts Work Center, among other places, and grants from the Ford Foundation, the Massachusetts Arts Council, the Arizona Arts Commission, and the Maryland Commission on the Arts. He’s exhibited in many cities, including New York (Barbara Toll Gallery, The Hyde Collection, Damon Brandt Gallery, The Drawing Center, Claudia Carr Gallery, Nancy Margolis Gallery, and Art in General); in Boston (Alpha Gallery) and Tokyo (Japanese International art Expo, and Zephyrus Contemporary Art.). In Maine, he’s been included in Biennials at the Portland Museum of Art, and Maine Center for Contemporary Art. He has had solo exhibitions with the Colby College Museum of Art, University of Maine-Farmington, Maine Center for Contemporary Art, and ICON Contemporary Art. (ICON represents Mitchell’s work in Maine). He teaches studio art at Colby College and this semester he is the coordinator of the senior studio art majors. He lives in North Yarmouth, Maine, with his wife and son. A few weeks ago, Dylan Hausthor’s friend lit another friend’s barn on fire. She set the blaze out of spite, simultaneously incited by gossip and provoking gossip. After a few minutes of watching the fire creep up old barn wood she–who was 7 months pregnant–felt her water break, going into labor six weeks early. She ran across the street to the property-owner’s house demanding a ride to the hospital as the proof of her arson was smoking right behind her. In Past The Pond, Setting Fires, Dylan Hausthor manipulates landscapes that are simultaneously autobiographical, documentary, and fictional: a weaving of myth and symbol in order to examine the chaos of storytelling. Sun-bleached beer cans, waterlogged ferns, and moonlit deer paths seem to be traces left by these stories–field recordings of instability told by an even more precarious narrator. The often disregarded underbelly of a post-fact world seems to be the simultaneous beauty and danger of fiction. Small-town gossip, elementary humanity, relationships to the land, and spectacle inspire the images in Past The Pond, Setting Fires, as he tells stories filled with tangents and nuances–echos of the gossip that he hopes that he hopes to both reflect and provoke. Cult of Womanhood is an in-progress body of work that begins to explore the female gaze and the mysticism often associated with sexually empowered women. Littoral Books is pleased to invite you and your friends to join us in celebrating the publication of Agnes Bushell's new novel The House on Perry Street. Filled with an array of eccentric characters, from railwaymen of the Gilded Age to Wobblies and Bolsheviks, artists, bohemians, hippies, hipsters and mystics, The House on Perry Street is a sweeping tale of a family (five generations of Tallis women), a neighborhood (Greenwich Village), and a country (this one), a matriarchal epic from a writer who has been charting America's political landscape since the appearance of her first novel, Local Deities, in 1990. A photographic exhibition hosted by The Yellow Tulip Project, a local non-profit aimed at smashing the stigma around mental illness and building community. Through a powerful black and white photography exhibit visitors will begin to understand that mental illness is a silent epidemic that touches so many yet we can’t see it the way that we see physical illness. The goal of the exhibit is that someday soon people will feel less alone and able to speak openly about mental illness in the same way that we talk about physical illness. May is Mental Health Awareness Month and this photo exhibit will be the first in a series of events and activities all aimed at letting people know that "Hope Happens". After the Portland opening the exhibit will eventually become a traveling exhibit to be viewed at libraries, schools, and public spaces. The Yellow Tulip Project also envisions an eventual virtual exhibit that schools can include in health curricula when discussing mental illness and stigma. May 9, Facing Stigma: Creating Solutions, A Facilitated Workshop 5-7 p.m, open to public. *This event is currently full, thank you to all those who participated! May 12, Closing Event - Be Well Wellness Event 10 a.m.- 12 p.m., open to public. Here was a nice write up of the GOGO event. Looking forward to the Bakery opening in 2018! 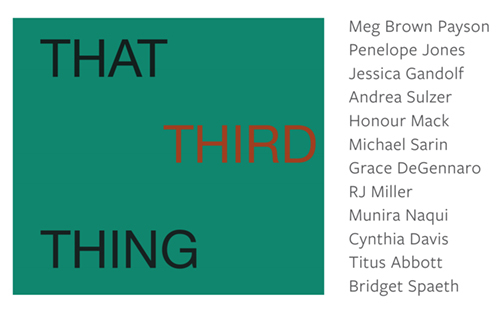 “That third thing” is a month-long project which convenes performing and visual artists who have chosen to work within abstract strategies. The gallery installation will juxtapose materially-based work of nine contemporary visual artists curated by Bridget Spaeth and an improvisational music program developed and produced by Titus Abbott. Within abstract syntax are the roots of our humanity; objectively neutral as a system, yet (as with this gathering) every artist and performer brings their own intent to bear. It is the curator’s intent to create the opportunity for reflection, experience, and the benefits of the peripheral and scanning gaze, while the creative collaboration and spontaneous composition of the musicians unfolds. In truth, “that third thing” refers to no “thing” at all, but to a quality of relationship established by the individual artists within their own bodies of work. As the musicians establish a base for improvisation and collaboration in time, their work performs a similar craft. As audience, our experience becomes yet another refrain of this “third thing”: object, subject and the event of our perceptions. Experimental in nature, this project stems from a curiosity about unexpected experience and/or connections between these abstract forms, which share their roots and resonance within the mind. and release in our physical and emotional landscapes. 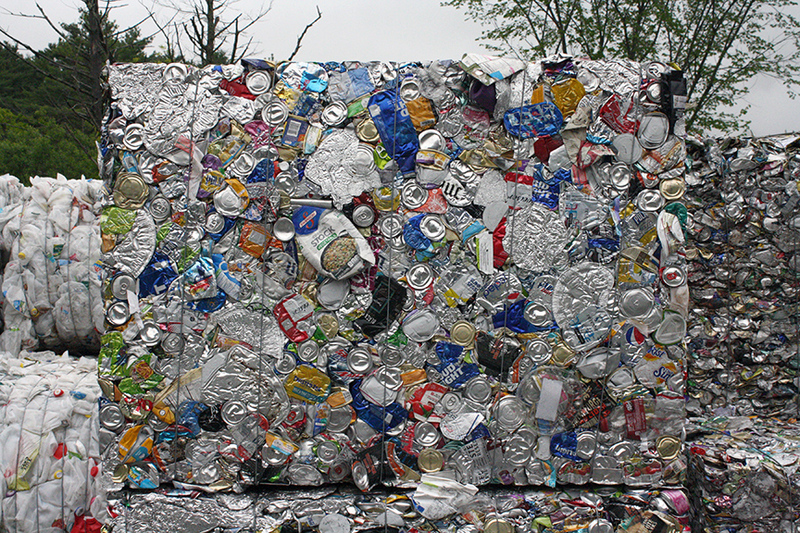 Opening September 16th with a reception from 5-8 pm, the show invites visitors to consider individual and collective consumption as manifest in five mini-bales of recyclable materials that non-profit solid waste manager, ecomaine compressed and loaned for the exhibition. Also on view are photographs Herman took of our trash being incinerated and our recycling being sorted both mechanically and by hand. Herman is pressing pause on the recycling process to allow visitors to contemplate their own patterns of consumption, as well as the various conduits for release available to us, and the personal, cultural and global implications of material excess and disposability. To facilitate such reflections, Out of Sorts includes benches fabricated from salvaged wood by Benjamin Spalding and upholstered by Amy Emmons with fabric printed with Herman’s photographs of bales of recycling and municipal woodpiles. Visitors can sit on the plushly cushioned benches and register the visual, visceral, and psychological impact of what she calls “simultaneously minimalist and maximalist monuments to communal efforts to keep things out of the landfill.” Materially manifest in the strata of these intimate yet anonymous commodities is evidence of how we eat, drink, work, play, and clean, and how much attention we pay to discarding things responsibly. In addition to a First Friday reception October 6th from 4 to 8pm, ecomaine’s Environmental Educator, Katrina Venhuizen, will discuss the “art” of recycling and the importance of composting food waste on Friday, September 29th from 6-8 pm. Additional events include two “witnessed releases” Herman is choreographing, including Surrender Sunday, when anyone looking to let go of something weighing them down can consult one-on-one with a compassionate listener/receiver on Sunday, October 1st from 12-2 pm. Herman will give an artist talk Friday, October 13th at 6 pm. Out of Sorts ends with an Emotional Value Auction on Saturday, October 14th from 12-5 pm. Anyone interested in releasing an object they desire to pass on to someone who will value it and know its history can inquire about participation by emailing adrianeherman@gmail.com. “Bids” will take the form of written statements of interest in an item. At the end of the “auction,” each item’s owner may choose a winner. Everyone is welcome to witness these meaningful exchanges between strangers. All events take place at 630 Forest Avenue. Herman has exhibited widely and lectured at over fifty institutions. Her work is in collections including the Whitney Museum of American Art in New York. She is a Professor of the MFA in Visual Art at Maine College of Art, and holds a BA from Smith College and an MFA from the University of Wisconsin-Madison. Out of Sorts, a subsidiary of Herman’s projects Goods Riddance, and The Freeing Throwers, was facilitated by ecomaine, Hour Exchange Portland, The KISMET Foundation, and Yarmouth Public Works. Artist Talk on The Loved ones, at Speedwell Projects, presented by Smith Galtney and Matthew Papa. Opening Reception for The Loved Ones, at Speedwell Projects, July 1st, from 5:30 PM to 7:30 PM. Featuring works by Smith Galtney and Matthew Papa. Wildlife of the Imagination featuring work by Barbara Sullivan and Vicki Latimer Roan. Opening reception on May 6th, 5:30-7:30PM, with a reading by Debra Spark from her new novel, Unknown Caller. "The work here represents seven years of exploration and the development of a new visual vocabulary... a change from the small, hand-held paper work I made for many years. I'm interested in seeing what happens when I apply a process that has mostly been done on paper, like woodcut or letterpress printing, to fabric; or the inverse, working traditional embroidery stitches into paper. This cross-pollination is invigorating and challenging, as are the odd, discarded materials I find to use. My dress forms, garments, and accessories are stand-ins for ideas about the passage of time, loss, identity, and mortality--some of what it means to be human." Crystal Cawley is an artist who works with paper, textiles, collected objects, and re-purposed materials. Her work explores ideas of identity, time, and loss, and draws on various traditional skills like embroidery and letterpress printing. This exhibition is a collective response to the unique and challenging time in our world's history that we face together. Together we seek to build bridges, not walls. The goal of the event American Beauty is to provide opportunities for artists to collaborate on social issues, including sustainability, equity, and inclusivity. In this way, we develop nimble, flexible, forward-thinking, optimistic, and innovative solutions to today's challenges. Our goal in this exhibition is to underscore the humanitarian values we believe in: embracing diversity, overcoming racial and ethnic exclusion in America, offering safe haven to immigrants in need, practicing tolerance and respect toward those with different sexual orientations or gender identities, supporting women's rights, and making progress on protecting the environment. Interactive theater workshop using first person immigrant stories with The Angle Project from NYC at 12 PM on Saturday, January 21, SPEEDWELL Projects, 630 Forest Ave.
Open mic and poetry slam at SPEEDWELL Projects at 630 Forest Ave at 2 PM. Poetry reading and the recitation of Other Inaugural Poems by nationally recognized poets and writers from 3-5 PM at SPEEDWELL Projects at 630 Forest Ave.
Exhibition by visual artists at Zero Station and SPEEDWELL Projects at 1 North Street, 630 Forest Ave all day January 21. Evening Arts Ball with keynote address by Fatuma Hussein of The Somali Women’s Organization at 7 PM at the Maine Mechanics Hall, 519 Congress Street. Performances by Hi Tiger, Sudo Girls and the Theater Ensemble of Color at 8 PM. Dancing with DJ’s Innox and 32French into the wee hours! A candle lit dinner and fundraiser. Final Mourner's Kaddish-333 Days in Painting was a special event and fundraiser held in conjunction with Max Miller's exhibition Good Night. All proceeds will go to help produce Mr Miller's book of the same name. Final Mourner's Kaddish was produced over a 333 day period of consecutive prayer and painting, saying the prayer Kaddish for his recently deceased father. For more information please contact SPEEDWELL projects. Mr Miller is planning to show this work at The Maine Jewish Museum in the summer of 2017. Unlike a traditional solo show which typically represents one body of work, Juliet Karelsen's exhibit Groundless will explore parallels and contact points across multiple bodies of work, shedding light on the artist’s breadth of process and perspective. In all of Karelsen’s work we see a profound sensitivity to her subjects—be that her dying father and his caregivers, the nostalgic collectibles amassed in a home soon to be sold, or the delicate matter that makes up the ground beneath our feet. Karelsen’s work reveals an acute attention to place and the way we find meaning in time, through our longing and attachment to others (and to objects), despite their ephemeral nature. The title Groundless emerges from the Buddhist concept of humans existing on a groundless ground, in emptiness, in open space, and from the Buddhist goal of becoming comfortable in our psyches in dwelling on this groundless ground. Juliet Karelsen studied painting at The School of The Art Institute of Chicago and The Skowhegan School of Painting and Sculpture. She has been painting for many years and experimenting with different forms of stitching for the last few years. Her work has been shown across Maine, New York City, Boston,Ohio and abroad in Spain, Argentina and Switzerland. She was born and raised in New York City and has been living in Maine (mostly) since 1991. Max Miller is a lifelong painter. He holds a BFA from RISD and an MFA from Yale. He is a Guggenheim Fellow as well as the recipient of a New York Foundation for the Arts grant and a Pollack Krasner grant, among others. His work can be found in many collections, including the Metropolitan Museum of Art. He lives and works in New York City. Good Night focuses on the relationships between human beings, their dwellings and their earth-bound perspective, and the night sky or cosmos beyond. In addition to GOOD NIGHT SPEEDWELL projects also launched a candlelit dinner and fundraiser to help produce Max Miller's limited edition book of watercolors called FINAL MOURNERS KADDISH-333 DAYS IN PAINTING. Opening reception with performance by Lawrence Kovacks on organ. Wolcott Dodge's painting and collages, as well as his found objects, merge an interest in modernist painting and assemblage, with a fascination for obsessive collecting and recycling. This exhibition reveals Dodge's democratic love for all materials, texture and pattern. A true romantic and collector, his work hearkens back to the collections of 19th century cabinets of curiosity, and his re-contexualized objects resonate with a sense of nostalgia for a past once lived, and a value long forgotten.